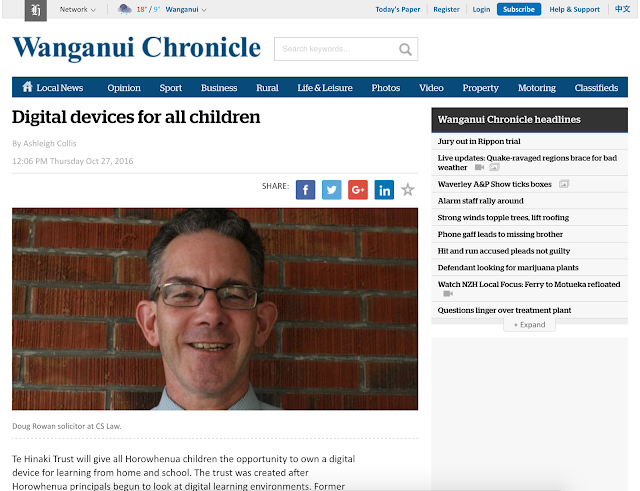 A recent article by Ashleigh Collis in the Horowhenua Chronicle talks about the founding of the Te Hinaki Trust, which was formed in 2015 with the goal of improving access to digital technology for learners in Horowhenua, following the same approach as Manaiakalani. Te Hinaki trustee Douglas Rowan talks about how the trust was formed after visiting the Manaiakalani cluster in Auckland: "I have never seen a change in achievement patterns like I've seen with Manaiakalani. It was unbelievable."